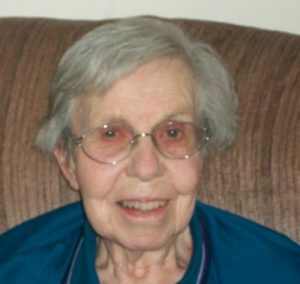 Dominican Sister of Peace Margaret Marie (Helen Elizabeth) Hofstetter, 97 died at the Sansbury Care Center on January 27, 2019. She was born in 1921 in Nashville, TN, one of the six children of Margaret Sanders and Oscar Hofstetter. She entered religious life in 1944, and served God and God’s people faithfully for more than 70 years. Sr Margaret Marie earned a Bachelor of Arts in History, Social Studies and English from Siena College, which she used in her early ministry of teaching and educational administration in Kentucky, Ohio, and Nebraska. She continued her studies at St. Mary College in Notre Dame, IN, where she earned a Master of Arts in Scripture/Theology, and DePaul University in Chicago, where she earned a Master of Arts in History. Sr. Margaret Marie served her community as President of St. Catharine College in St. Catharine, KY, from 1969 to 1975, after which she studied at the Institute of Spiritual Leadership to earn a certificate in Spirituality. Sr. Margaret Marie’s studies in religion and spirituality were important to her work as a Pastoral Minister in Tennessee, a participant in the House of Prayer at Bethlehem University in Israel, and as a member of the Governing Board of her founding congregation. Her experience in Israel moved her to encourage other Sisters to minister outside of the United States, preferably in a developing country. Sr. Margaret Marie loved to study and wanted to share her love of learning with others even after she retired. She spent nearly nine years working in adult education in the diocese of Jackson, MS, before she returned to the Saint Catharine Motherhouse where she volunteered at the Earth Center, and also assumed the Ministry of Prayer. For her funeral Mass, Sr. Rose Marie Cummins chose the Gospel reading from Mark about the feeding of the 5,000, saying that Sister Margaret Marie took Christ’s message to feed the people to heart. She recounted how Sr. Margaret’s work with the marginalized, the hungry and thirsty were her way of feeding Christ’s people, and she did it with love. Sr. Margaret Marie was preceded in death by her parents and three of her 6 siblings. She is survived by one sister, Sr. Adrian Hofstetter, one brother, Rev. Robert Hofstetter and several nieces and nephews. A Vigil of Remembrance Service was held on January 30, 2019, at the Dominican Sisters of Peace Sansbury Care Center Chapel in St. Catharine, KY. The funeral liturgy was also held at the Sansbury Care Center Chapel on January 31, 2019, followed by burial at the St. Catharine Motherhouse Cemetery. Memorial gifts in Sr. Margaret Marie Hofstetter’s memory may be submitted securely online or sent to the Dominican Sisters of Peace, Office of Mission Advancement, 2320 Airport Dr, Columbus, OH 43219. What a privilege to have known Sister Margaret Marie! She and her sister Adrian joined us on our first Parable study tour in the Dominican Republic. Her experience in Israel, her common sense and sense of humor gifted us amidst some tough days. Her love of Jesus and of study revealed her strong spirit! Now may she enjoy the presence of God Whom she served so faithfully.